If you want to know what to wear when you come on vacation to Safed, it's fairly easy in the summer and winter, but during the spring and fall you can be caught by surprise. According to the Israeli Meteorological Service, the average annual rainfall for Safed is 712mm - about 28 inches, but under normal circumstances the rain only happens in the winter. Starting in September and October with the occasional heavy storm, the real rainy season starts properly in November and can linger through until March or even April. In recent years, however, there has been a drought in the whole country, and in the winter of 2010/11, it didn't downpour properly until the middle of December when there was two months of rain in two days (177mm, 7 inches)! December, January and February are the months with both the most rain and the most days of rain. Nevertheless even January, which is the wettest month, is still sunny half the time! So even if you come prepared for rain, don't be surprised if it's actually nice and sunny. If you don't want to bring an umbrella there are plenty available in the shops during the winter, although you may want to pack galoshes, as rain boots can be hard to find. Occasionally Safed gets snow, and temperatures can fall as low as -7C (20F) in February, with January and February being the coldest months. Even then it can get as high as 21C (70F) in the middle of the day so don't bother to bring your skis! If you forget your hat and gloves there are plenty in the shops, however you can always tell a real Israeli - they are the ones walking around with short shirtsleeves in the middle of winter! Once the rains have finished it's blue skies and sun all the way and you can count yourself lucky to see even one white fluffy cloud in the sky! July and August are the hottest months, with temperatures as high as 39C (102F), and even at night temperatures don't usually fall below 18C (64F)! With most days of summer being in the more comfortable high 20's or low 30's (82F-90F+) you will enjoy walking around the city. However, in the hottest part of the day many of the shops take an afternoon siesta. In the evenings you might need a sweater or light jacket, but like the locals, you will probably welcome the cool breezes coming off the mountains. During a shrav, when it's hotter than usual for the time of year, you have to watch out for heat stress, as it can get very dry in Safed. There are usually weather advisories on TV and radio, and for English speakers you can check out the weather sites or listen to the internet radio station Rusty Mike for the latest weather reports. When it's very hot and dry it can also be very dusty, with winds bringing sand in from the desert and you may hear people talking about a hamsim. Humidity can fall as low as 10% so you really do have to think -desert conditions- even though Safed is in the mountains. Nevertheless take precautions even if it isn't quite so dry when you visit. Do like the Israelis do and carry a water bottle around with you at all times. It is very easy to get dehydrated so keep yourself hydrated with water or fresh juice, and avoid coffee and alcohol, which can dehydrate you even further. 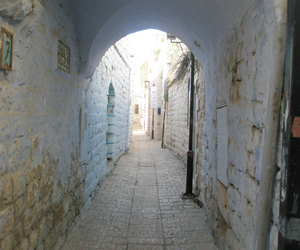 Enjoy your visit to Safed.